The following Terms and Conditions apply to all IVC2018 Exhibitors, and form an integral part of the IVC2018 Exhibit Agreement. Click on the arrow icons below to expand and read each paragraph. Please read it through carefully. 1.1. Congress refers to the 45th International Viola Congress 2018 (IVC2018), taking place from November 20th – 24th, 2018. 1.2. IVC refers to the organization behind the Congress, part of the Dutch Viola Society. 1.3. The Primary Congress venue is the Hofpleintheater, a building containing a theatre facility at the visitor address Benthemplein 13, 3032CC Rotterdam. 1.4. The organization Hofplein Rotterdam is the owner and operator of the Primary Congress venue. 1.5. 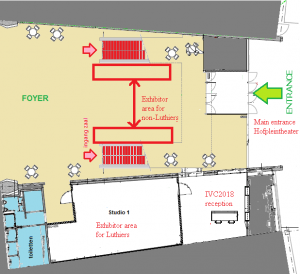 An Exhibit constitutes an assigned rented space and related services (further defined in clause 2), assigned to an Exhibitor at the Primary Congress Venue. The Exhibitor is expected to use this space to display, promote and sell his products and services. 1.6. An Exhibitor refers to the representative(s) of a company or institution that has requested an Exhibit at IVC2018. (b) the subsequent non-automatic, explicit acceptance of the booking request by the IVC. 1.8. The Congress Manager refers to either the IVC Chairman or the Congress Production Manager. 2.2. The full Exhibit fee includes the unit rental fee (defined in clause 2.1. above), plus the cost of additional (optional) services requested by Exhibitor. 2.4. The full Exhibit fee is applicable, even if the Exhibitor does not occupy the full rented space. 2.5. A second Exhibit (space and services) can be requested by the same Exhibitor, subject to availability. 2.6. One unit of Exhibit space consists of:a volume with the following dimensions / boundaries: 2.0m wide x 1.6m deep x 2.1m height (6.5 ft x 5.2 ft x 6.9 ft). 3.2. Exhibit location assignments are at the discretion of the Congress Manager. 09:00h – 18:00h (Nov. 21st – 23rd). 3.5. The Exhibit must be open (operational) during all Exhibit hours, unless otherwise agreed with the Congress Manager. 3.6. At least one Exhibitor representative must be in charge of the Exhibit while open. 3.7. Exhibits must be promptly closed at the end of Exhibit hours. 3.8. As the Exhibits are considered an integral part of the Congress, all Exhibits must be set up on Tuesday, November 20th by 11:00h (am), unless an exception has been negotiated with the Congress Manager. 3.9. Exhibitors can begin setting up their Exhibits on Tuesday November 20th, starting at 08:30h (am). 3.10. Exhibits will close at 16:00h on Saturday, November 24th. Exhibitors are expected to maintain their Exhibits until that time, unless an exception is negotiated with the Congress Manager. 3.11. Exhibits must be fully dismantled, packed, and moved / shipped out of the Primary Congress venue by 17:00h on Saturday, November 24th. 4.1. Included in the Exhibit Agreement is the provision of (part of) a table, and one or more chairs. These furniture items are mandatory, i.e. the Exhibitor is not allowed to replace them with his own furniture without prior approval by the Congress Manager. 4.2. The Exhibitor is allowed to set up additional display panels, banners etc., provided that these do not infringe upon the defined boundaries of the Exhibit space, and as long as they do not constitute a safety risk to staff, other exhibitors, or congress audience. 4.3. Exhibits must not obstruct the view of, or interfere physically with other exhibits. 4.5. The Exhibitor is required to provide his own protective table cloth for the full rented surface of the table, or to rent such cloth from the IVC (see clause 2.7 above). 4.6.. Access to a power outlet (characteristics: 230V AC/50Hz, Type F grounded plugs) can be requested at a limited additional cost (specified in clause 2.9 above). Maximum supported power consumption is 100W, typically enough to drive one or two laptop computers, an electronic payment terminal and/or a phone charger. This service is not intended to power large electronic devices, lamps, heaters/coolers, cooking equipment, etc. 4.7. Internet access may be requested at a limited additional cost (see clause 2.9 above). 4.8. The IVC does not guarantee the Quality of Service for the internet connection. The service supports low bandwidth services only (e-mail, purchase processing etc.). High bandwidth activities such as multimedia streaming etc. are explicitly not supported. 4.9. The internet connection is a shared resource between all venue users (IVC offices, exhibitors and congress participants), and it shall be used responsibly. If Internet is used to process orders and payments, the Exhibitor must be prepared to support a backup/alternate way to process them. 4.10. During the Congress, reasonable storage space will be provided for shipping cartons and packing materials. Where possible, such materials may be stored under the Exhibit table. 4.11. The Exhibitor’s products and packing materials must comply with all municipal, regional, and national fire safety laws. 4.12. 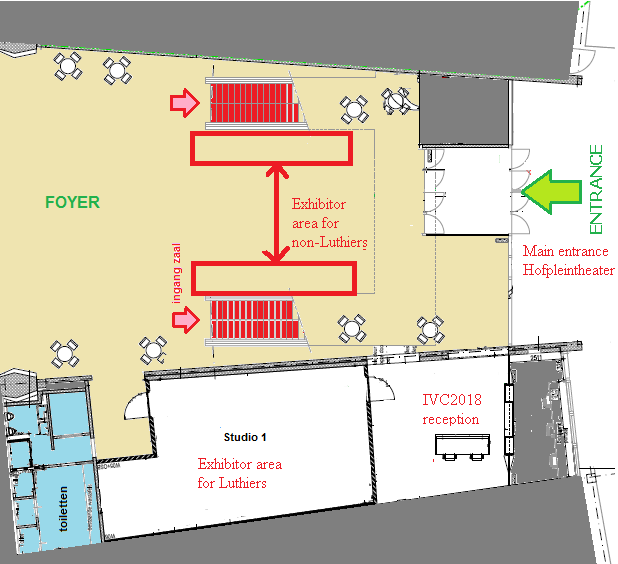 During night hours (18:00 – 09:00), the Exhibitor may leave his products and equipment in Studio 1, which will stay safely locked until the next Congress day. 5.1. Exhibitors who intend to ship materials to IVC2018 will receive exact shipping information once the Exhibit Agreement has been established. 5.2. Shipping of Exhibit materials (to and from the Primary Congress venue) is the sole responsibility of the Exhibitor. All necessary arrangements for shipping shall be made ahead of the Congress. The IVC and Hofplein Rotterdam will not be able to assist with the shipping process in any way. 5.3. The IVC assumes no responsibility for goods delivered to the Primary Congress venue prior to the Congress, nor for materials remaining in or leaving the Primary Congress venue after the last day of the Congress. 5.5. The Exhibitor is responsible for collecting and reporting taxes for sales made during the Congress. 6.1. Nothing shall be posted on, tacked, nailed, screwed or otherwise attached to the walls, floors, ceiling, or any other parts of the Congress venue building or furniture. 6.2. Any damage charges in connection with the restoration or protection of the building, equipment, or furniture will be at the expense of the Exhibitor. 6.3. The Exhibitor shall ensure damage/accident insurance coverage for his own materials and representatives present at the IVC venues. 6.4. 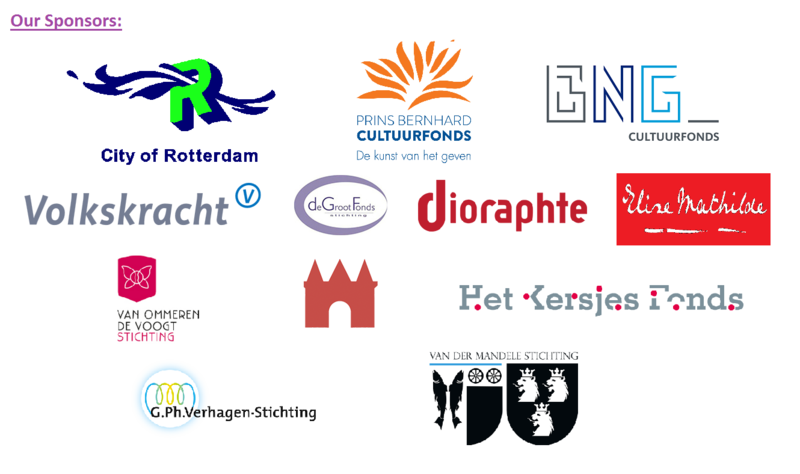 Exhibitor acknowledges Exhibitor’s understanding that IVC’s involvement is limited to assisting the Exhibitor with respect to Exhibitor’s use of the Hofplein Rotterdam facilities and presentation of Exhibitor’s goods and services at IVC 2018. In consideration of IVC’s and Hofplein Rotterdam’s efforts in so assisting the Exhibitor, the Exhibitor, its officers, agents, employees, members, successors, and assigns, hereby releases and holds harmless the IVC and Hofplein Rotterdam, their directors, officers, members, agents, employees and volunteers from all claims, damages, liabilities, losses, and expenses (including attorney’s fees), of any kind and nature whatsoever, arising from or related to Exhibitor’s use of the facilities and presentation of Exhibitor’s goods and services at IVC 2018. 7.1. An Exhibit Booking shall be requested using the on-line IVC2018 Exhibit Booking Request Form. Booking Requests submitted by e-mail, telephone or other communications are not considered valid. 7.2. Upon Exhibitor’s submittal of the IVC2018 Exhibit Booking Request Form, the IVC will notify the Exhibitor by e-mail within 5 working days whether or not the request has been accepted. 7.3. The confirmation of a booking request will include an invoice for the related fees (depending on the booking options selected by the Exhibitor). This invoice must be paid by the Exhibitor within 15 working days (3 calendar weeks). 7.4. When the IVC has confirmed the payment of the invoice, the Exhibit Agreement will be considered fully established. The Exhibit Agreement includes full acceptance of the mutual obligations defined in these Terms and Conditions. 7.5. In case the IVC is unable to accept and confirm the Exhibit Booking request (e.g. if spaces are already fully booked), the Exhibit Agreement will not be established. 7.6. Cancellation of a confirmed Exhibit Booking may be requested in writing by sending an e-mail to: finance.ivc2018@dutchviolasociety.nl. 7.8. In the very unlikely event that the IVC2018 itself would be cancelled, the IVC will cancel all confirmed Exhibit Bookings, and the Exhibitor will receive a 75% refund. 7.9. The Amount Due for payment is indicated in the invoice issued by the IVC, upon confirmation of an Exhibit booking request. 7.10. Payments to the IVC are accepted in EURO currency only. 7.11. All payments to the IVC are free of VAT (Dutch BTW). 7.12. Payments to the IVC shall be made exclusively by bank transfer (*). Other forms or means of payment (e.g. Credit cards, cheques, or cash payments) are not accepted. (*) Full bank details for the IVC are given on the IVC2018 Contact and Bank Information page. The online payment service TransferWise is recommended for international transfers from outside Europe. 7.13. All bank transaction costs shall be covered by the Exhibitor, also in the case of refunds being paid by the IVC. 8.1. The Exhibitor will not be permitted to set up his Exhibit at the Congress venue until all agreed fees have been paid. 8.2. The Exhibitor shall not reassign, sublet, or share his/her Exhibit space without written consent of the Congress Manager. 8.4. These TERMS AND CONDITIONS FOR IVC2018 EXHIBITORS form an integral part of the Exhibit Agreement between the Exhibitor and IVC. The full cooperation of Exhibitors is expected in their observance. 8.5. In case of infringement of these Terms and Conditions, IVC reserves the right to revoke the Exhibit Agreement with the Exhibitor, and to deny his access to the Congress venues, without refund. 8.6. Any specific local regulations issued by Hofplein Rotterdam will become part of the Exhibit Agreement. 8.7. All points not covered herein are subject to the decision of the Congress Manager. 8.8. Place of jurisdiction for disputes concerning the Exhibit Agreement is Rotterdam, The Netherlands. The Exhibit Agreement shall be governed and construed according to Dutch laws.